Cheap-Chic Decor: Storage Bench and More! Looking for a perfect storage solution for outerwear? We love the SEI Storage Rack Bench! 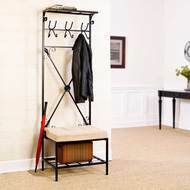 This unit not only gives you a place to hang umbrellas, coats, and bags, but you also get the convenience of a spot to sit down to take your shoes on and off. A lower shelf provides shoe storage without cluttering the floor and an upper shelf perfect for hats and knick-knacks, tops the unit off. It's perfect to fill that empty space next to your front or back door.